Today, more than 3,000 employees are working worldwide at Anton Paar. The measuring technology group from Graz (Austria) is continuously recruiting new employees. However, it is not easy to find these people. CEO Friedrich Santner explains why: "What we do at Anton Paar is sometimes difficult to grasp. Terms such as rheology, X-ray structure analysis, Raman spectroscopy or Zeta potential measurement are not part of our everyday vocabulary. Our employees are professionals who are setting new standards in an international high-tech industry with the highest quality standards." These are the reasons why the Styrian metrology group is holding a job fair on November 9 from 2 p.m. to 6 p.m. at its headquarters in Graz. We are looking for software developers (m/f), design engineers (m/f), metal technicians (m/f), electronics technicians (m/f), IT specialists (m/f), junior managers, and many more. 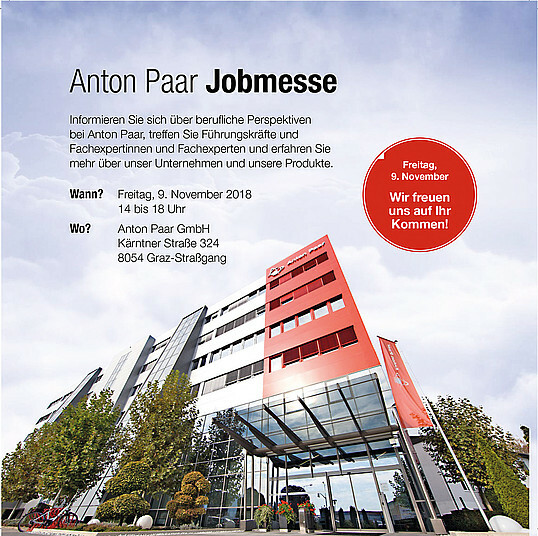 On Friday, November 9, anyone interested can find out about career prospects at Anton Paar and talk to employees and managers. Our mechanical production with its state-of-the-art machinery, electronic manufacturing, and instruments assembly are open for visitors. During the demonstration of some high-tech measuring instruments, experts will talk about the everyday products in which Anton Paar's know-how is prevalent. Chocolate, toothpaste, mobile phone displays, asphalt, beer, and detergents are just a few of them. All guests are invited for a snack and a beer in the new SUDHAUS employee restaurant to get to know one of the many advantages that Anton Paar employees can enjoy every day. Find more information about working at Anton Paar in our (german) job brochure.